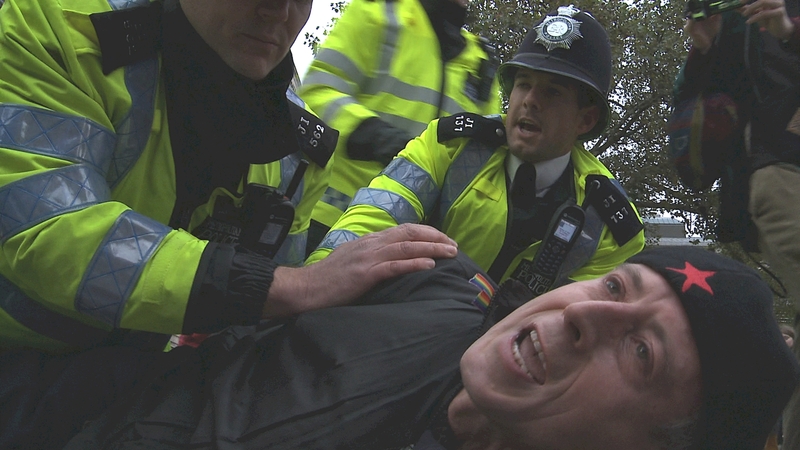 Police arrested human rights campaigner Peter Tatchell when he unfurled a West Papuan flag as the Indonesian President’s limousine departed Westminster Abbey in central London this afternoon, during a State Visit to the UK. “I went to where the President’s motorcade was passing and tried to hold up a West Papuan flag. Unidentified men in plainclothes wrestled me to the ground. I was then arrested by Metropolitan Police officers, who claimed they were acting at the request of the President’s entourage. The officers applied unnecessary, excessive force, given that I was no threat and was not resisting arrest,” said Mr Tatchell, who is Director of London-based the human rights organisation, the Peter Tatchell Foundation. He was one of nearly 100 protesters who had gathered to protest at human rights abuses by the Indonesian regime. “President Susilo Bambang Yudhoyono should have been arrested on charges of war crimes and crimes against humanity under British and international law. I settled for displaying the West Papuan flag as the President’s motorcade passed by. I was stunned to be arrested for a peaceful, lawful protest. “The Indonesian President stands accused of crimes against humanity in East Timor and West Papua, involving the deaths of thousands of people. “It is appalling that the Royal Family and the Prime Minister are hosting a man who is implicated in mass murder. Well in excess of 100,000 West Papuan civilians have been killed by the Indonesian army. “Under Indonesian rule, West Papuans are denied basic human rights, including freedom of expression. Two Papuan men, Yusak Pakage and Filep Karma, have been jailed for 10 and 15 years respectively for merely raising the West Papuan flag. Foreign media and human rights groups are denied access to the region by the Indonesian Government. “The Indonesians annexed West Papua in the 1960s. The West Papuan people never agreed to be a part of Indonesia. Jakarta maintains its rule by military force. It refuses to allow the people of West Papua the right to self-determination, in flagrant defiance of the United Nations Charter. “A long, slow genocide is being perpetrated in West Papua. “A police officer intimidated by a pointed finger? Bizarre. Are police officers nowadays really such ultra-sensitive souls? Heavens help us if they have to deal with hardened criminals with weapons. “I was put in rigid handcuffs that were twisted by the police, which pinched the nerves in my wrist; causing agonising pain. It seemed like this was deliberate. I am still in pain hours later but what was done to me is nothing by comparison to the daily brutalities inflicted on the heroic people of West Papua by the Indonesian army of occupation. The Indonesian President’s State Visit to the UK is from 31 October to 2 November. arrest, East Timor, Indonesia, International law, Peter Tatchell Foundation, police, protest, royal family, self-determination, State visit, Susilo, Tatchell, West Papua.